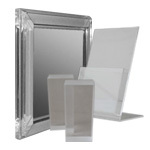 Redco™ Acrylic sheet products are of the highest quality with tight thickness tolerances. Redco™ Acrylic offers an economical and longer lasting alternative to glass with its high optical characteristics and low stress levels. Redco™ Acrylic is a product with outstanding optical clarity, beauty, weather resistance, and won’t yellow with exposure to the sun. It can be fabricated into almost any form, be easily cut, drilled, cemented, polished, formed or molded to the most exact specifications. Redco™ Acrylic sheet is produced in various surface finishes and colors to satisfy a multitude of design and fabrication possibilities. It is strong, light weight and available in transparent, translucent and opaque colors or colorless sheets. Excellent light transmission and does not yellow after prolonged exposure to sunlight. Resists many chemicals including ammonia solutions, dilute acids and aliphatic hydrocarbons. More shatter-resistant than glass and is available in a special bullet resistant thickness. Half the weight of glass and only 40% as heavy as aluminum. Redco™ Acrylic sheet is readily available in a variety of standard sizes and thicknesses, in colors and colorless (below). Cutting Tolerance: + or – 1/8” on cut sheets, allow .125” for saw cut. Where close tolerance must be held add 20%. Call for quotes on extra-large sheets. Cut sheets: Any foot increments off 48” width (not available at all locations). EXTRUDED PROFILES AND TUBES ALSO AVAILABLE.